Welcome to Week #8 of the OCG 2018.01 format. 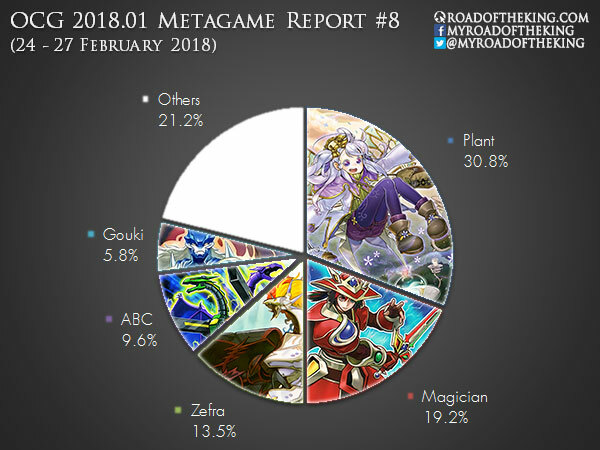 This report will cover 52 top-performing decks from 8 tournaments that were held in Japan during 24 – 27 February 2018. The popularity of Plant continues to soar as many renowned Japanese players have made the switch to Plant. Tsujimura Ryosuke “ひつじ” (2017 World Champion) went 6-1-1 and finished 2nd in “37th Adachi CS with Hatti CS” (Team 3v3). 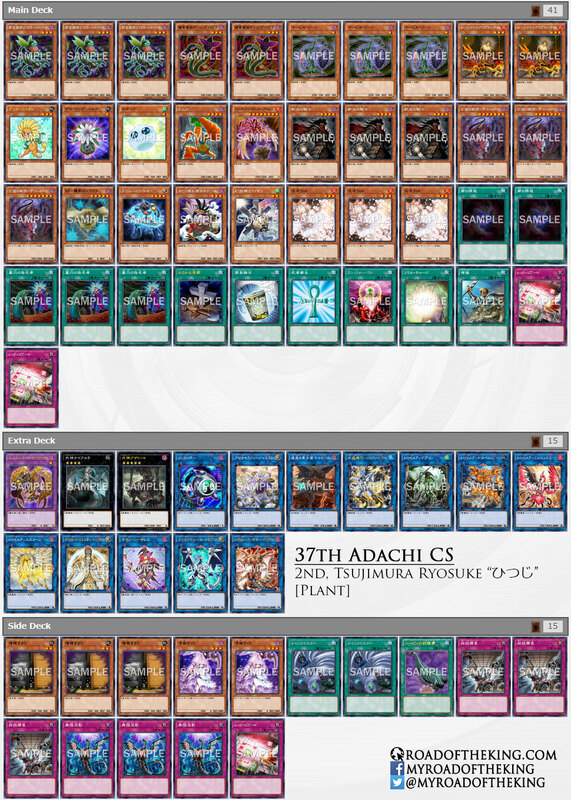 Momiji Daiki “モミジ” (5 – 8th in World Championship 2016, 9 – 26th in World Championship 2017) went 4-2-2 and finished 1st in “37th Adachi CS with Hatti CS” (Team 3v3). 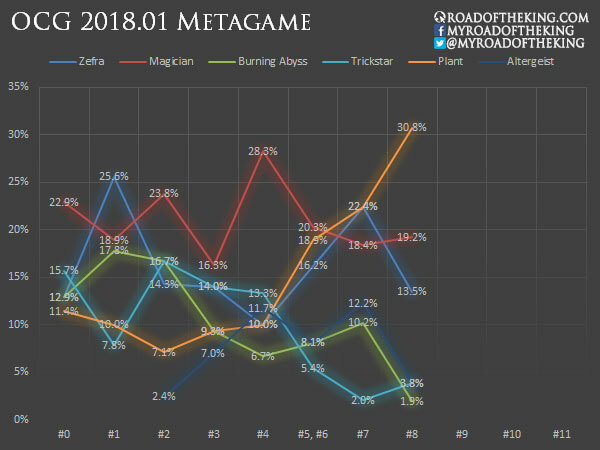 They were originally playing Zefra earlier in OCG 2018.01 Metagame Report #1, but have made the switch as Plant became much more formidable with the addition of Call of the Grave, Red Reboot, and the Knightmares. 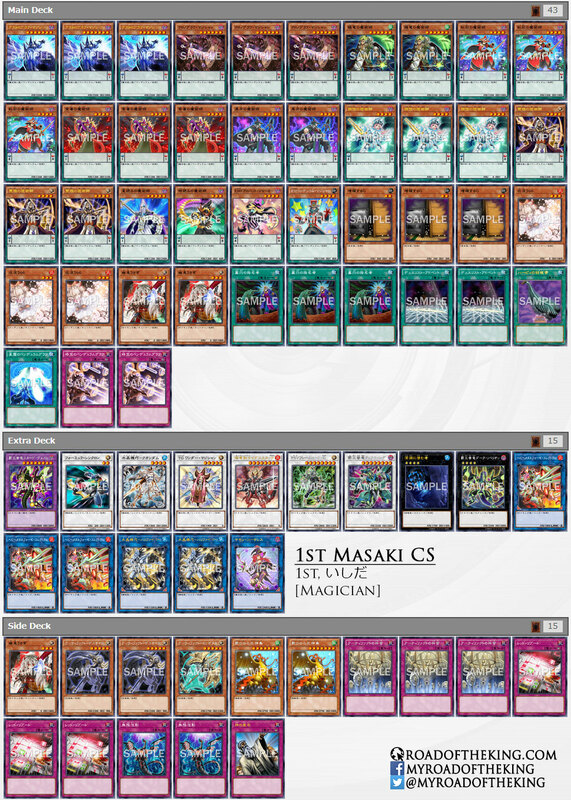 Ishida (いしだ) went 8-0-1 and finished 1st in “1st Masaki CS” which had 60 participants. He had brought back an old school tech – Mist Valley Apex Avian. In addition to being Pendulum Summoned, Mist Valley Apex Avian can also be Special Summoned by the effect of Chronograph Sorcerer. This potentially allows Mist Valley Apex Avian to negate twice in the same turn. Takepuu (たけぷぅ) went 6-2 and finished 3 – 4th in “1st Masaki CS” which had 60 participants. He ran a small package of Genex cards (2 Genex Undine, 1 Genex Controller, 1 Crystron Rosenix, 1 Mecha Phantom Beast O-Lion in the Main Deck, and 1 Link Spider in the Extra Deck) for a more explosive Crystron Needlefiber opening. Genex Zefra is a very high risk high reward build. 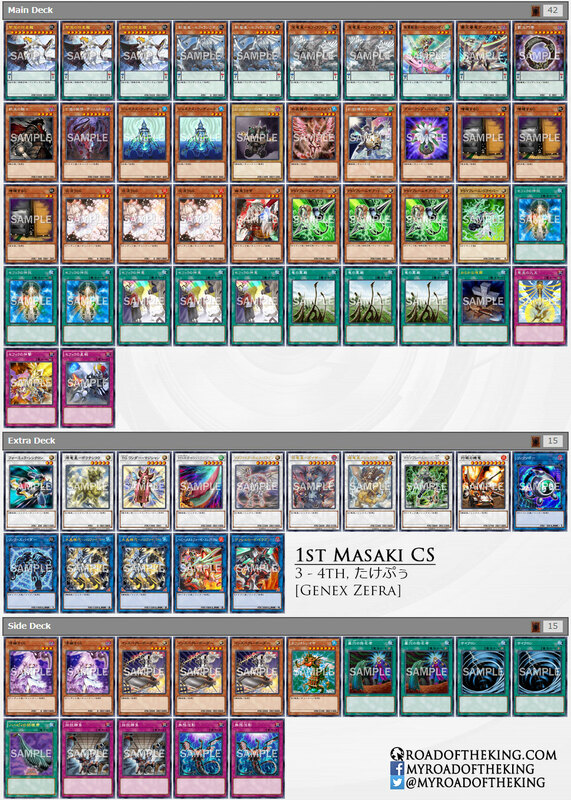 Drawing Genex Controller or Crystron Rosenix in the opening hand would cause the whole Genex Undine combo to brick. Yada Makoto “バコ” (5 – 8th in World Championship 2016) with his teammates, Muhi (むひ) and LinkLink, finished 1 – 2nd in “64th Aichi CS with Hatti CS” (Team 3v3) which had 57 teams (171 participants). All 3 of them were playing the exact identical 70 cards, but finished with varying records. Yada Makoto went 6-2-1, Muhi went 8-0-1, and LinkLink went 4-3-2. ABC aims to turbo out Crystron Needlefiber, which would in turn develop into a board of Firewall Dragon, Knightmare Gryphon in the Main Monster Zones and ABC-Dragon Buster in the Extra Monster Zone. The effect of Knightmare Gryphon creates a soft-lock, preventing Special Summoned monsters which are not linked from activating their effects. Having 3 Main Monster Zones open allows ABC-Dragon Buster to split into A-Assault Core, B-Buster Drake, C-Crush Wyvern during the opponent’s turn. 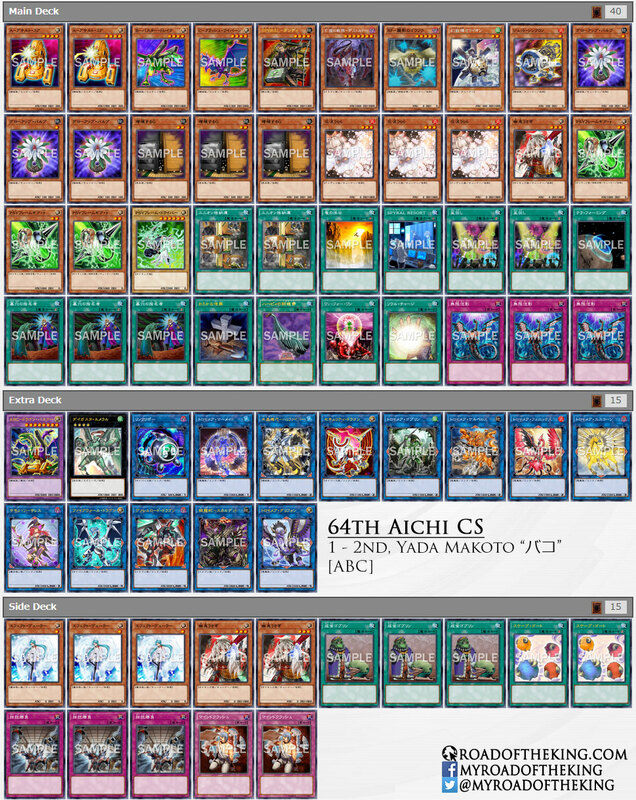 Any two of A, B, C can be used to Xyz Summon Daigusto Emeral, whose effect would then shuffle ABC-Dragon Buster back into the Extra Deck, enabling ABC-Dragon Buster to be Special Summoned a second time. Plant is pulling ahead, while the Pendulum decks, Magician and Zefra, are holding on steadfast behind. The performance for ABC this week is heavily skewed by the data from the result of a single tournament. We will have to observe if ABC could replicate its success across various other tournaments before we can conclusively evaluate its strength in the current competitive scene. Is it a typo that I can count actually 53 decks in the breakdown part? Is it a typo that I can count 53 decks in the breakdown part?